Since opening our doors in 1947, Grieb’s Pharmacy, has proudly served seven generations of families in the community with a commitment to outstanding customer service. Still in our original location, our family-owned pharmacy has become a landmark in downtown Darien where customers depend on our knowledgeable team of pharmacists, technicians and staff to offer expertise and professional advice. Your health and well being is our number one priority. Our pharmacists work efficiently to quickly fill your prescriptions and keep your waiting time short. Prescriptions can also be refilled on our website or you can also download our free app, My Community Pharmacy. Do you need an immunization or flu shot? Our certified pharmacists are experts at giving shots and offer a private counseling room for your convenience. Grieb’s delivers! Our friendly drivers are on call daily and delivery is available to Darien and the surrounding towns of Norwalk, Stamford, and New Canaan. Comprehensive inventory includes cough and cold remedies, vitamins, household items, homeopathic and organic health care products, including gluten free and Paleo foods. We’ve got you covered for all your medical and quality-of-life needs. Medical Supplies are available for purchase or rent including nebulizers, Medela breast pumps, crutches, wheelchairs and walkers. We carry an in-depth assortment of braces, slings, and wraps for all injuries. We love babies! Grieb’s carries a many lines of baby products including Pampers diapers, Burts Bees and Mustela. For special gifts and cosmetics, you’ve come to the right place! We carry many lines of beauty and bath products, hair accessories, hostess gifts, candles, cards, jewelry and toys for all ages. Before heading out of town, check out our wide selection of travel bags and accessories including compression and travel socks. Darien and Rowayton gear such as T-shirts, sweatshirts, caps, and other giftware are available at Grieb’s. Show your town spirit! Chuck and Debi Hibben are the Owners of Grieb’s Pharmacy. Together they live and have raised three children in the Darien community who through the years have all worked at the store making it truly a family business. Chuck began working at Grieb’s in 1974 as a pharmacist intern, and in 1983 bought ownership of Grieb's. Chuck, the Senior Pharmacist, has enjoyed practicing pharmacy for more than 40 years and knowing multi-generations of families. Chuck is passionate about helping our customers maintain or improve their health and is very knowledgeable on diet and natural remedies. Debi, a Darien native, oversees community and customer relations and brings unique products and gifts to Grieb’s. Debi enjoys her interaction with the community and the many personal relationships she has developed over the years with the Grieb’s customers. Our pharmacists are medical professionals who have an in-depth knowledge of the chemistry of various drugs and their reactions, and of possible drug interactions. Our pharmacists accurately measure and fill prescriptions, ensuring proper dosage and safety for our patients and are certified in immunizations and flu shots. Each of our pharmacists is skilled in educating our customers on how to take their medications and what side effects to be aware of. They advise customers about general health topics, such as diet, exercise, managing stress, and on other issues, such as what equipment or supplies would be best to treat individual health problems. Nancy has served as Grieb’s Pharmacy Manager since 2008 and is responsible for the overall operations of the pharmacy. She enjoys working in a smaller community setting where she has come to know many of our customers and their families. Tim has worked at Grieb’s since 2017. He provides our customers with quick and caring service, personal consultation, and medication review. Diana joined Grieb’s in 2013 as a staff pharmacist. 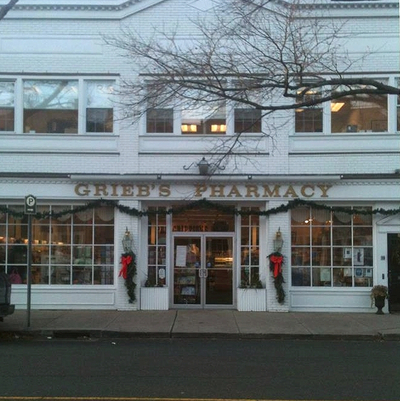 She has enjoyed getting to know longtime Grieb's customers and now as a Darien resident, the pharmacy feels like home. Sandra has worked at Grieb’s since 2003. She enjoys educating Grieb’s patients on their medications and answering their health questions, as well as providing them with their prescription medications and immunization needs. Mara is a pharmacy technician and has been a part of the Grieb’s family since 2012. Her primary goal is to keep Grieb’s patients happy and healthy. Denise has been working at Grieb’s since 2004. She is head of the compounding department and lead technician. Heather has worked at Grieb’s since 2009, first as a cashier and now as a technician. She will be graduating in 2019 with a B.S. in Nursing from Southern Connecticut College. Heather provides customers with optimal service in a warm and welcoming manner. Carolina has been a pharmacy technician since 2012 and enjoys being a part of the Grieb’s team and assisting our customers. Chris has been part of the Grieb's team since 2013 and enjoys the variety of responsibilities as a pharmacy technician, salesperson and driver.